Sunday, February 19, 2017 … 10:55 A.M. ….. 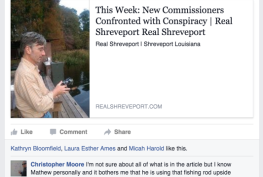 If nothing else, the Caddo Parish Commission is consistent in its abuse of taxpayers. Now, without public debate, the Commission has conjured a way to raise our property taxes AND perpetuate them … defeating the expiration dates Caddo voters previously dictated. Majorities of us voted TEN-year terms for these taxes: one of the four set until January 1, 2019, another January 1, 2021, and the other two January 1, 2022. Regardless, the Commission is now using its huge stores of our money – and the sheer complexity of such issues – to extend these “10-year” taxes as many as 15 years into the future … January 1, 2032. This dump of toxic government is set for an April 29th vote … at least the first one. As the Commission proudly proved in our voter defeat of a 2013 property tax, it will force us to vote it down twice, at least. … An .86-mill property tax, originally voted November 17, 2007. … Had reduced to .81-mills in 2013-2015, and if passed would be .83-mills. … Left alone – no April vote – it remains in effect until January 1, 2019. … An April 29th “Yes” vote would extend it from January 1, 2019 until January 1, 2029. … A .90-mill tax voted May 1, 2010. … Has now reduced to .78-mills, and if passed would be .87-mills. … Left alone – no April vote – it remains in effect until January 1, 2021. … An April 29th “Yes” vote would extend it from January 1, 2021 until January 1, 2031. … A 2.01-mill tax voted May 1, 2010. … Had reduced to 1.89-mills in 2013-2015, and if passed would be 1.97-mills. … Left alone – no April vote – it remains in effect until January 1, 2022. … An April 29th “Yes” vote would extend it from January 1, 2022 until January 1, 2032. … A 2.77-mill tax voted May 1, 2010. … Had reduced to 2.60-mills in 2013-2015, and if passed would be 2.72-mills. The Commission’s “Schedule of Millage Rates 2013-2017” details how these taxes had inched-down over the years from their original millage settings. Owing to the Commission’s tax “roll-forward” after the 2015 property Assessment, passage would raise the total levy .31-mills … from the four-tax total of 6.08-mills in 2013-2015 to 6.39-mills after. It is no surprise that the Commission cooked-up this mess without public hearings, much less debate. The subject Resolution 94 of 2016 was voted forward – by title only – from a Work Session to a Regular Meeting on November 14, 2016. Then, at that Regular Meeting, on November 17th, the package was voted in … without comment. Loudly demonstrating just how little the Commission needs ANY more of our money, it is now pouring new scads of it into each subject department / agency … workers leaned-on to pass this latest insult. Compared to 2015, the 14-of-14 departments / agencies the Commission funds are this year scoring an overall 13.4% spending increase … as high as 26.6% for some.